The phaon crescent, Phyciodes phaon (Edwards), is a common southern crescent that frequents moist open areas. 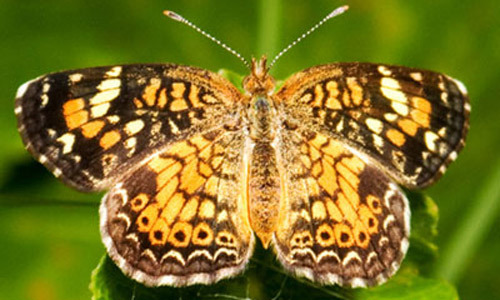 It resembles the pearl crescent that is found in the same areas, but differs by the more checkered fringe on the wings. Figure 1. Adult phaon crescent, Phyciodes phaon (Edwards). Photograph by Robert Lord Zimlich. The phaon crescent is found from coastal North Carolina throughout the southern parts of the Gulf states to southern Texas and westward to southern California. It strays north to Iowa and Nebraska. The wingspread is 2.3 to 3.2 cm. The upper surface of the wings is brown with orange checkered spots and the front wings have a median white to yellowish band (also visible on the undersides). The undersides of the wings are orange and light tan with blackish brown markings. 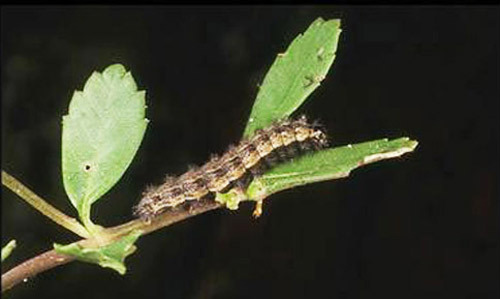 Larvae are variable in color from olive to brown with dark subdorsal bands and white lateral bands. Both thoracic and abdominal segments have transverse bands of scoli each of which bears brown setae. Figure 2. Larva of phaon crescent, Phyciodes phaon (Edwards). Photograph by Jerry F. Butler, University of Florida. There are several flights (early spring to late fall) in the northern part of the range and nearly year round in peninsular Florida. Males patrol open areas near host plants for females. Mating occurs primarily during mid-day. Eggs are laid in clusters on the undersides of leaves of the fogfruit host plants, Phyla (=Lippia) spp. (Verbenaceae). 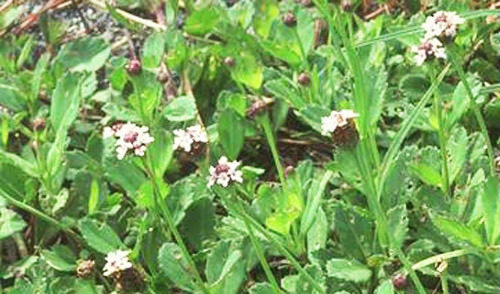 The common host throughout much of Florida is turkey tangle fogfruit, Phyla nodiflora (L.) Green also known as capeweed, mat plant, creeping charlie, and match heads. Figure 3. Turkey tangle fogfruit, Phyla nodiflora (L.) Green (Verbenaceae). Photograph by Donald W. Hall, Entomology and Nematology Department, University of Florida. Daniels J. 2003. Butterflies of Florida. Adventure Publications. Cambridge, Minnesota. 256 pp. Minno MC, Emmel TC. 1993. Butterflies of the Florida Keys. Scientific Publishers. Gainesville, Florida.